Discussion in 'Music and Recordings' started by sorrodje, Oct 4, 2015. Just got back from 9 days travel, this had been released on Bandcamp. Funky, big-band-ish, tightly woven, big drive. Even jetlagged, waiting for my espresso machine to heat up, I feel the motion. Allison Miller, Myra Melford, Jenny Scheinman, and more. A wake up call! shabta, Changeling, jowls and 1 other person like this. And now for a completely different new release (ECM via ProStudioMasters). Spacey instead of earthy, more conceptual than playful. Jinxy245, shabta, Pharmaboy and 1 other person like this. This one has been on my wishlist since its release but I just didn’t have the time to buy and listen...until today. And this goes straight into my top list for the year, despite being released in October -18. Check it out, it’s not at all too far out there. Very pretty jazz. Always wanted to see Ravi play, never managed to. Can you imagine trying for a career playing jazz on the tenor sax--w/the last name, "Coltrane"? It's impossible. But he's done it--has played consistently at the highest level for 30+ years. Yes, he's really worth listening to live. I was lucky to hear this trio last year. From the stage, Ravi Coltrane and Matt Garrison (son of jazz bass great Jimmy Garrison) shared how Jack DeJohnette was their musical "uncle" in Chicago when they were teenagers. It was amazing to hear the three together, with DeJohnette in the superb form that he has shown in the last several gigs I've heard him at. They have a beautiful trio album "In Movement." Qobuz has arrived in the US and I've started to explore what I can get there, like Revisiting Grappelli. Something else, via Qobuz, really delightful in its lightness and blues inspiration, listen to the whole album! Jinxy245, jowls and dark_energy like this. Another Qobuz-routed wonder. Matthew Shipp does not record much and was rumored to have retired, but no, he's just out with this amazing effort. Intense, many layers, hard to describe, but definitely more avalanche and rushing water than foot-tapping. Pharmaboy and Jinxy245 like this. Thanks for introducing this, I have been enjoying it immensely. There is a new album out today on bandcamp, which is even more delicate. Re eyes is stunning. Chris Potter's new Circuits on Edition/Bandcamp (James Francies on keyboards, Eric Harland on drums, Linley Marthe on bass) goes back to the sometimes straight-ahead, sometimes almost Middle-Eastern work Potter did with Dave Holland in the early 00s. As always, Potter's sax play has move depth and surprise than you expect at first. Having heard him play with Harland live many times, I'm delighted again by their interplay, with Potter's sax becoming almost a rhythm instrument. This is going to stick, for sure. PS. I wrote the above when I was on the 3rd track (The Nerve, which I shared via YouTube). I It's getting even better. Funky, be-bop, late 60s Miles, fusion, all of that mixed up in a driving blend. Totally not the AACM and New York avant-garde styles that I sometimes go for (I have a couple of those waiting), but so much fun! I saw Motian just once & it was memorable (w/Jim Hall Quartet at Village Vanguard, mid '90s). He continually hit accents I didn't even know where there. Very different drummer (no pun intended). Last time I heard him live was also at the Vanguard, in 2008, with Joe Lovano and Bill Frisell. This session was recorded around the same date. New Bandcamp free jazz night: Chi (Dave Liebman/Adam Rudolph/Hamid Drake) is more exciting, unpredictable, driving than maybe-too-influenced-by-twelve-tone Clockwise (Anna Webber). Jinxy245 and Pharmaboy like this. I have been ecstatic all morning listening to this amazing new album, Sun of Goldfinger, David Torn, Tim Berne and Ches Smith. Yikes! No thanks to my chaotic schedule/bad planning, I've missed Allison Miller's Boom Tic Boom band when they were in the neighborhood, but we have been so enjoying her energetic, fun, original, never stale recordings in Otis Was a Polar Bear and now Glitter Wolf (Bandcamp rules as always!). Enjoy! Never heard of this guy, but he's lodged in my brain now. Love his fluid, articulate style. He's been strongly influenced by Joe Lovano, among others (I hear some Sam Rivers in there, too). Gaspasser, Smulder and Pharmaboy like this. 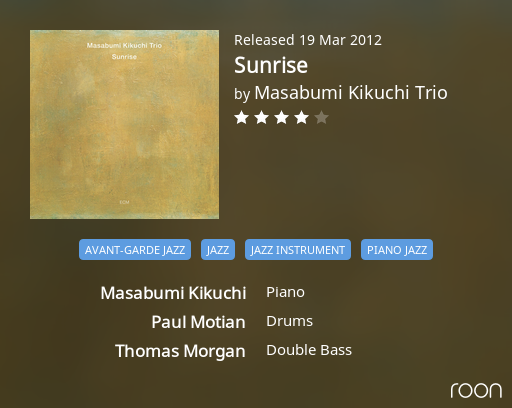 As I've been pestering y'all, I am a big fan of the late drummer Paul Motian, but somehow I had missed his last studio appearance, in Masabumi Kikuchi's Sunrise, which I bumped into via Qobuz and Roon 1.6's new-and-improved Radio feature. 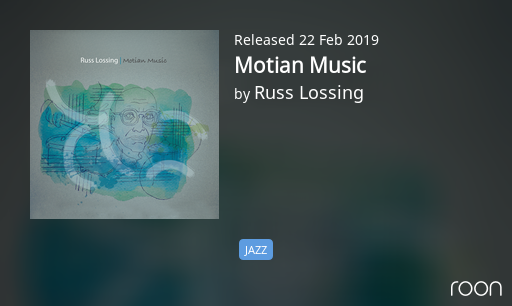 This is a pointillistic, improvised ECM session that magically builds on the listener, with Motian's ever-so-subtle brush strokes swinging shooting stars between Kikuchi's notes and Thomas Morgan's slow, sliding note work. Speaking of whom, Morgan was in top form with Bill Frisell and Rudy Royston at Freight & Salvage, Saturday in Berkeley. Totally different music, much more roots than jazz, which is a weird closing of the circle because the music I last heard Motian play live with Frisell (and Joe Lovano) was much closer to Sunrise. Never bored, ever learning and being surprised by the awesome gift of musicians like these. I humbly bow my head in respect.